How do I get the most recent posts on my Facebook newsfeed using my iPhone 6 Plus? Only feeds from yesterday are showing. I don't know because I don't use Facebook. Having said that, it's possible that Facebook is experiencing problems updating their feeds. Have you tried contacting Facebook support for an explanation or a remedy? 1. Pull down on the top of your Newsfeed to refresh it. 2. 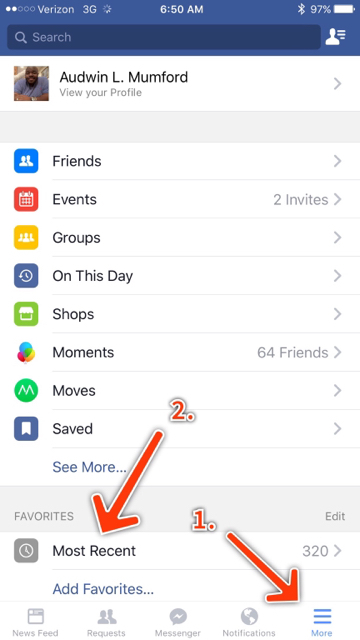 Force close your Facebook app by double tapping your home button and swiping up on the app, then try again. 3. Make sure you have an open data connection. This has been broken for some time in all three; web site, Android app, and iOS app. Regardless of how it's set, I still see posts from last week instead of seeing recents. I ended up installing Facebook Purity for Chrome on my desktop PC and my laptop and that finally fixed it. It drives me crazy on my phone. Open the app, click on More on bottom left, scroll down and click Most Recents or something similar. This is my biggest complaint with the FB app. The best way I've found is to go to More then scroll until you find most recent and view it that way. I've had better success with the mobile web page in Safari sticking on Most Recent but even that reverts sometimes. I can't get into games on my iPad Air 2? How to have Find Friends on Watch to show only favorites.